This page refers tae Tripoli, the ceety in Greece. For ither uises, see Tripoli (disambiguation). 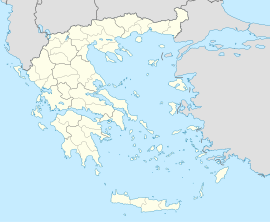 Tripoli (Greek: Τρίπολη, Trípoli, umwhile Τρίπολις, Trípolis; tradeetionally Τριπολιτσά Tripolitsa) is a ceety o aboot 25,000 indwallers in the central pairt o the Peloponnese, in Greece. It is the caipital o the prefecture o Arcadie an the centre o the municipality o Tripolis, pop. 48,000. Wikimedia Commons haes media relatit tae Tripoli, Greece. This page wis last eeditit on 18 September 2018, at 04:51.